Fahrenheit 451 by Ray Bradbury was first published back in 1950 as "The Fire Man," a shorter version that appeared in the magazine Galaxy Science Fiction. 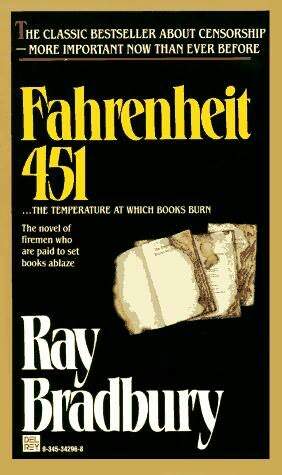 It was published as Fahrenheit 451 in 1953. This classic dystopian novel was the perfect choice to read during Banned Books Week. I must admit I had never read this book before. I knew it was about a fireman, Guy Montag, whose job is not to put out fires but instead to start them, burning books which are banned in the future world in which he lives. That's about all I knew. When we first meet Montag, he is seemingly content with his job and his life. But then he meets a girl who starts asking questions and opens his eyes to the reality of the world around him. A world in which people no longer read, but it's more than that. They no longer talk with each another about anything meaningful. They spend their days in their parlors watching wall-to-wall televisions, interacting with their "friends" who appear on their walls and entertain them. I had gone into the novel thinking it was mainly about censorship and book burning, but as stated above, it really isn't. I was expecting the lack of books but not the complete world Bradbury creates in this novel. It was so dismal and depressing, and while the missing books contributed to that, it was also the lack of human interaction and caring, and the lack of knowledge and interest in learning about things. It really was more of a statement about the damaging effects of television. I also found it to be a statement of the times in which it was written, in a sense. Bradbury, writing in 1950, would naturally think of a future world overrun with television, atomic bombs and fast cars. It was interesting to read a dystopian novel written so long ago because there is no reference to computers or other modern devices that are prominent in most dystopian novels written today. But many of the overarching themes do carry through to our world today. There is certainly plenty of suspense as to what is going to happen next, and quite a bit of action to keep the story moving. Bradbury's writing style is a bit too literary for my taste, but it was a fairly easy read and I am glad I finally got around to reading it. Have you read Fahrenheit 451? What did you think of it? This review was written based on a copy of Fahrenheit 451 that I purchased. I need to reread this one. I read it last year, probably for banned book week, and it made a big impact on me. I teach this book often. It's one of the most important books of the last 100 years. Love it. I loved this book! It's an important book for everyone who loves reading. We certainly can't take books for granted.